Lateral Cooking is, in a sense, the ‘method’ companion to its bestselling predecessor, The Flavour Thesaurus – and is just as useful, ingeniously organised and enjoyable to read. 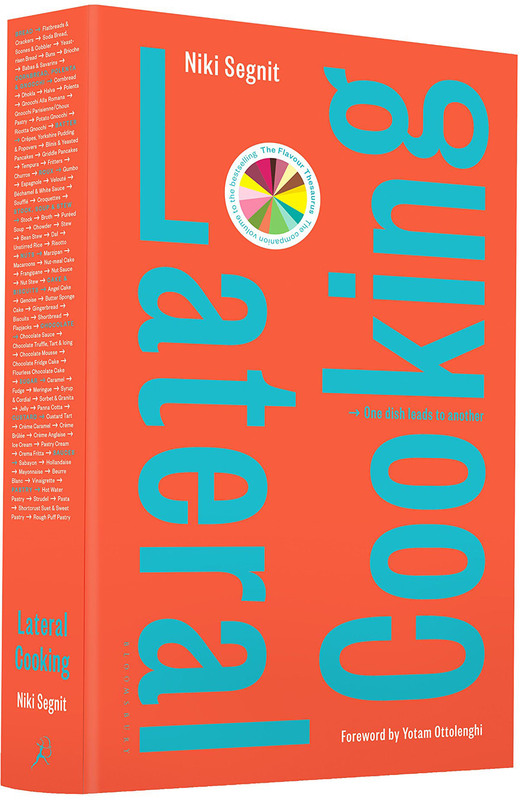 The book is divided into 12 chapters, each covering a basic culinary category, such as ‘Bread’, ‘Sauces’ or ‘Custard’. The recipes in each chapter are then arranged on a continuum, the transition from one recipe to another generally amounting to a tweak or two in the method or ingredients. Which is to say, one dish leads to another: once you’ve got the hang of flatbreads, for instance, then its neighbouring dishes on the continuum (crackers, soda bread, scones) will involve the easiest and most intuitive adjustment. The result is greater creativity in the kitchen: Lateral Cooking encourages improvisation, resourcefulness, and, ultimately, the knowledge and confidence to cook by heart. Lateral Cooking is essentially a practical book, but like The Flavour Thesaurus it’s also a highly enjoyable read. The ‘Flavours & Variations’ sections, for example, draw widely on culinary science, history, ideas from professional kitchens, observations by renowned food writers and personal recollection. Entertaining, opinionated and inspirational, Lateral Cooking will have you torn between donning your apron and settling back in a comfortable chair.